It’s all on the line this series – will you be there? Witness Australia’s greatest sporting rivalry live! It’s all on the line for the 38th annual State of Origin Series. 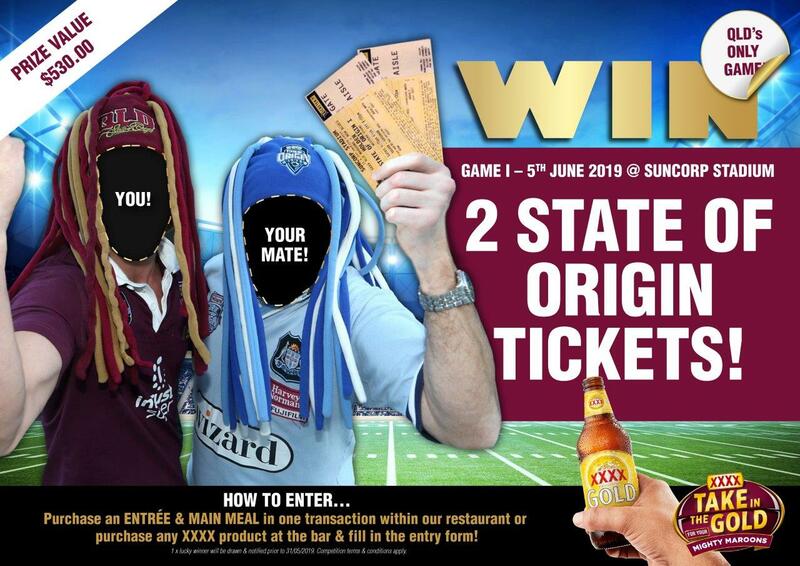 Brisbane is set to host Game One on June 5th at Suncorp Stadium – Win tickets for you and a mate! New South Wales will be looking to defend their title this series. In 2018, the “Baby Blues” secured their first State of Origin series victory in four years. Queensland’s new-look Maroons side will be out for state pride and have something to prove against the growing number of optimistic NSW fans. Before this series, QLD had won 21 times, NSW 14 times, with 2 series drawn. Game 1 is crucial for both teams, who are equally desperate to kick-start the series on a high note. A strong performance has the potential to set their team up to win the series. With so much on the line, Game One is set to be a great night of footy – especially if you were to watch it live. Want to win tickets for you and a mate? We just so happen to have some. Enter our Competition during April for your chance to win! Receive an entry ticket into the competition when you purchase an entrée & main meal in one transaction in our restaurant OR purchase any XXXX product at the bar. Submit your completed entry ticket into our competition for your chance to win! Just eat, drink and be merry – and you could find yourself watching the State of Origin action live! Remember, entries are valid from 1st – 30th April, so don’t miss out.